Castroville’s St. Louis Day Celebration, which began in 1882 as a small church homecoming, attracts some 10,000 visitors to the historic Alsatian settlement each year. Upon arriving in Castroville, visitors will enjoy a worthwhile treat as they drive or stroll about the historic community. The quaint little city has numerous pioneer structures with Alsatian-style sloped roofs, scattered in among the contemporary ranch-style houses, is a sightseer’s paradise. The town, as a whole, is listed with the National Register of Historic Landmarks in Washington, D.C.
Castroville was founded by Henri Castro in September 1844 when he brought settlers from Alsace-Lorraine. It is the only Alsatian colony of its kind in the U.S., and pioneer Alsatian homes and structures can still be found in large numbers throughout town. The rock-walled bungalows that comfortably suited the early 19th century family are still thought a slight more livable than contemporary abodes. Most of the pioneer homes have been restored and are marked with Pioneer Castroville House (PCH) markers. The “Little Alsace of Texas” is quite unique in that the culture and dialect of the original Alsatian colonists, even in present times, remains very much visible. Many of the older folks still speak the true Alsatian dialect fluently, which is a mixture of German and French, with a sprinkling of English thrown in. St. Louis Catholic Church, with its majestic spire reaching 110 feet into the sky, is one of the most notable structures in town. The historic structure, built of native limestone and cypress, acclaimed a Texas Historic Landmark in 1970, recently underwent a much-needed complete renovation and face-lift. A taped narration of the church and parish can be heard in the vestibule of the church. Landmark Inn, formerly the Vance Hotel, was built circa 1849. 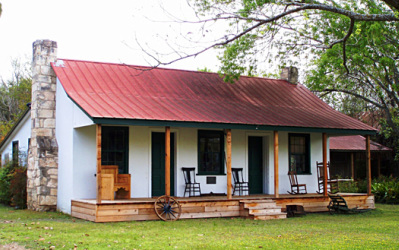 The Inn was donated to the Texas Parks and Wildlife Department by the late Miss Ruth Lawler in 1974. 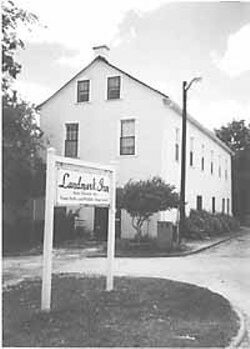 The Landmark Inn Historic Site offers comfortable and low-cost room accommodations to picnic goers. The old structure and lovely grounds are reminiscent of years past and are characteristic of Castroville’s pioneer homes. Write to Park Manager, Landmark Inn Historical Site, 402 Florence, Castroville, TX 78009, or phone 830-931-2133 for reservations or more information. Cross Hill seems to stand as a sentinel watching over the green and beautiful Medina Valley below and the local cemetery. Many historians are lured to this cemetery to look at its numerous grave markers dating back beyond the mid-1800’s. Inscriptions on tombstones are in five languages: English, Spanish, German, French and Latin.